From June 10 to August 25, 2006, Manzanar National Historic Site will host the “Enemy Alien Files, Hidden Stories of World War II” traveling exhibit which powerfully depicts the U.S. Government’s World War II policies that led to the arrest and internment of thousands of German, Japanese and Italian residents of the United States and Latin America. 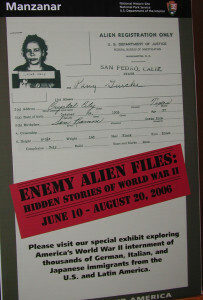 While Manzanar’s permanent exhibits focus on the internment of Japanese Americans in War Relocation Centers, the Enemy Alien Files exhibit examines the Alien Enemy Control program (AEC) that resulted in the round-up and imprisonment of more than 31,000 German, Italian, and Japanese Americans and Latin Americans and their families. On Saturday, June 10 at 11:00 a.m., renowned authors John Christgau (Enemies) and Stephen Fox (Fear Itself) will present a 90 minute program on the AEC. Karen Ebel, Esq., co-founder of the German American Internee Coalition will highlight current legislative efforts to achieve governmental review of the AEC program. Manzanar History Association will host a book signing with authors Stephen Fox, John Christgau and Ursula Potter from 1:30 to 2:30 p.m. Saturday. At 2:30 p.m. Grace Shimizu, director of the Japanese Peruvian Oral History Project, will join a panel discussion that focuses on the secretive Latin American program that forcibly brought German, Japanese, and Italian Latin Americans to the U.S. for internment during World War II. Former internees and their family members will tell their stories and share historic letters, photographs, documents and artifacts. At 7:00 p.m. Saturday, John Christgau will debut his performance of “Zip,” the gripping true story of a 17 year old German American boy’s experiences as an enemy alien. The performance will be presented along with a panel discussion and followed by a Question and Answer session and book signing. On Sunday June 11, from 10:00 a.m. to 2:00 p.m., several of the featured guests will be available to meet visitors, answer questions and share movies and artifacts. The exhibit and opening events are a collaborative effort of the National Park Service, the German American Internee Coalition, the National Japanese American Historical Society, the Japanese Peruvian Oral History Project, and the Enemy Alien Files Consortium.